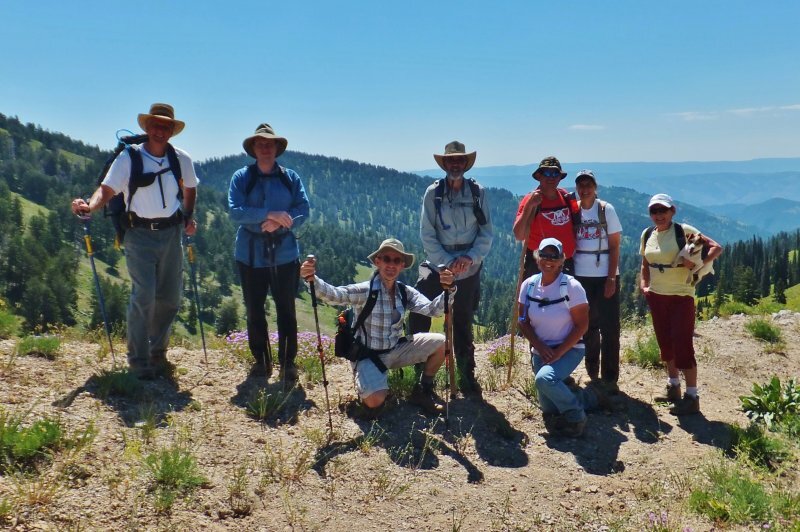 There were 11 people on the hike, Kip, LeVae, Terry, Joe, Ron, Ryan, Anne, Dan, Denis, Monika and Jim. Monika brought her dog, Fritzy. 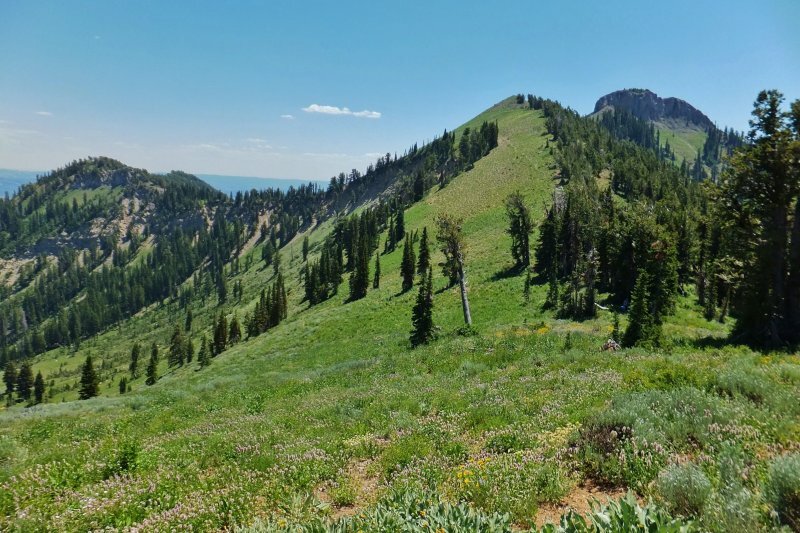 The hike from the parking lot to the Bear Hollow trail and Coldwater Spring was lush with huckleberry, thimbleberry, gooseberry, and Indian paintbrush among many others. When we got to the wilderness boundary sign, we headed towards Smithfield Canyon to find hillsides covered with little sunflowers which were beautiful against a cloudless blue sky. We also found coyote mint and blue flax. Anne and Dan did a portion of the hike to Smithfield Canyon and returned to Tony Grove. The rest of us continued hiking the seven sisters towards Mount Elmer. We encountered a couple and then a group of three hikers returning from Mount Elmer. None of those hikers used the Cottonwood Canyon trail. They simply went to Mount Elmer and back via the seven sisters. Monika's dog, Fritzy, became tired in the intense sun on the seven sisters, and during lunch she made a carrier and packed him for most of the hike. On the seven sisters ridge, we had spectacular views into upper Birch and Cottonwood canyons. We had difficulty finding the trail down Cottonwood Canyon [the Mt. Naomi Peak National Recreation Trail) and overshot it. We wound up on the top of the towering cliff faces of the cirque just below the peak of the seventh sister. 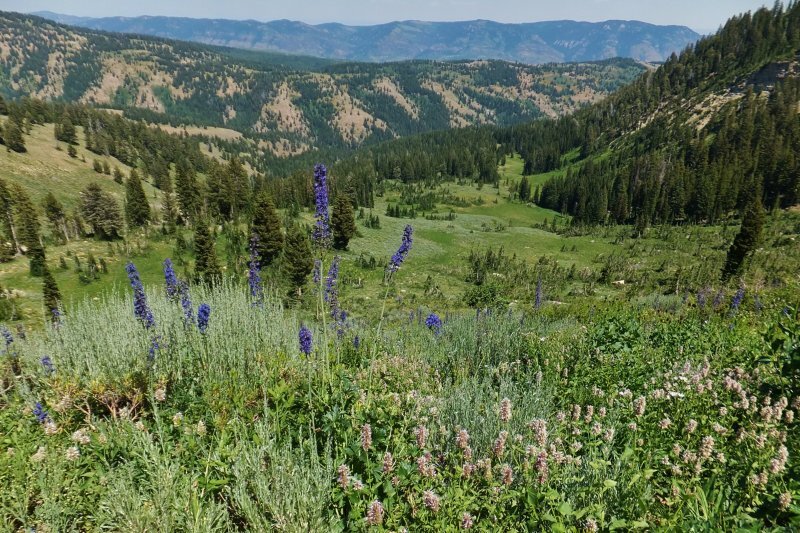 Our mistake rewarded us with columbine, delphinium and a wonderful view of Cottonwood Canyon. We went back and managed to find the trail, but it appeared that we were the first ones to use it this year. Due to the strenuous hiking and heat, many of us needed to get more water at Cottonwood Spring. The hike out of Cottonwood Canyon was hot and exhausting only to find a seemingly endless trek up the ridge to the wilderness sign. One hiker succumbed to heat exhaustion and delayed our return until he recovered. Several of us got a refreshing drink from Coldwater Spring before finishing the hike. We returned to Logan rather late. Despite the adversities of the hike, everyone seemed to enjoy it and did not mind the late return.